Hats off to Eduardo Garcia of Reuters Bolivia (we've feted the dude before due to his better-than-the-rest reports on Bolly) who published the following report on Reuters newswires last week (h/t reader PD). The red-in-bed way of "helping pregnant mothers"
So here's Garcia's piece. By the way, it's unlikely you've seen it before, because although it was a strong note on the Reuters newswire service, strangely and weirdly not a single open web service picked up on the note so strangely and weirdly it has managed to miss the eyes of those of us not equipped with a U$1,500/month Reuters terminal. It's almost as if they didn't want to you read it...strange'n'weird that, innit? LA PAZ, Oct 1 (Reuters) - Bolivia's economy is healthy despite the global slump because leftist President Evo Morales is redistributing soaring state revenue as subsidies to the poor, the country's finance minister told Reuters on Thursday. The Bolivian economy grew 3.2 percent in the first six months of this year, despite lower export income for natural gas, which is key to the Andean country's economy. The International Monetary Fund says Bolivia is likely to post the highest growth in gross domestic product, in Latin America at 2.8 percent. Finance Minister Luis Alberto Arce is even more optimistic. He expects GDP to grow 4 percent this year, largely because Morales has handed out money to the country's poor majority, which is boosting their spending. "Our policy was to make the cake bigger for Bolivians with the nationalization policies, to increase state revenue. Our second policy was to divide the cake better in order to give more to those who have less," said Arce. Arce said the subsidies are the "small engine of growth" that has allowed Bolivia's economy to grow despite lower export revenue caused by drops in demand and prices for natural gas. Moody's Investors Service and Fitch Ratings upgraded Bolivia's credit ratings last month, citing the country's good macroeconomic performance. But they noted that years of above-trend growth, the benefits of external debt forgiveness, limited foreign banking interests in the Andean nation and the absence of bad debts prevalent in developed markets helped Bolivia to avoid a direct fallout from the global crisis. Morales, an Aymara Indian from a poor background who took office in 2006, has increased taxes on foreign investors and has nationalized energy, mining and telecommunications firms. State revenue from the key natural gas sector boomed to $2.65 billion last year, from just over $1 billion in 2005, and revenue from the mining sector increased fourfold in the same period to $128.1 million. The country's foreign reserves have rocketed to around $8.5 billion from $1.7 billion at the end of 2005. Morales' government is spending some $320 million a year in grants to encourage parents to keep their children in school, in pensions for the elderly and in cash handouts to persuade pregnant women and mothers to go through health checks. 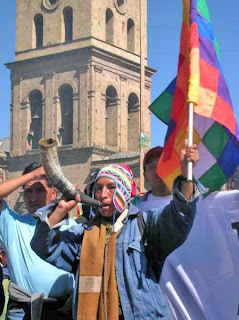 Earlier this year the government said that in 2008 nearly 2.4 million Bolivians received cash subsidies, roughly 25 percent of the country's population. That is on top of the nearly $200 million donated by Morales' main Latin American ally, Venezuelan President Hugo Chavez, that Morales has spent in hundreds of small education, sports and health projects since 2006. Although critics have said the government is giving subsidies to buy support from poor Bolivians, Arce says the stipends are a good way to redistribute wealth. "These are policies to redistribute income ... tomorrow when the poor of today are no longer poor, of course we're going to have to stop giving this support," Arce said. But the economist said that the government is likely to continue giving subsidies in the medium term because they stabilize the country. "We can't stop ... because it's something that brings social stability. Social conflicts have decreased greatly with our government because we're solving the social problems that people have," Arce said. Before Morales took office, three presidents in three years were forced to step down amid social unrest.